At Mayhew, we rescue and rehome hundreds of animals every year. We help unwanted dogs, puppies, cats and kittens that are looking for their forever home. Every animal receives a full behavioural and health assessment so that we can find them their ideal family. There is a lot to consider before adopting a new family member. We can help if you can no longer care for your pet. Could you temporarily foster a cat or a dog without a home? Not the right time to adopt? 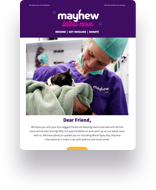 Please consider making a donation to Mayhew. We receive no government funding and your donations help us to take care of animals that desperately need our help. Do you need immediate help for your pet?